Use Picnam free for 30 days. Hunter and Clark use Picnam to manage scanned invoices and timesheets. "What a great program! I've been goofing off for months with other programs and this is the easiest to use and simple to boot." Bernhard R.
Picnam contains features to make working with scanned documents easier. The most common question people ask about Picnam is "Why did you choose to use text files for comments?" This article gives some of the reasons you might prefer to use text files rather than metadata to store information about your pictures. Picnam is ideal for making notes about scanned documents and photos for family history or genealogy. Digital photography makes it easy to take lots of photos, but they are very easily lost. What can you do to make sure your photos survive for years to come? Due to a lack of time to support and develop Picnam, we have decided to stop selling licenses. 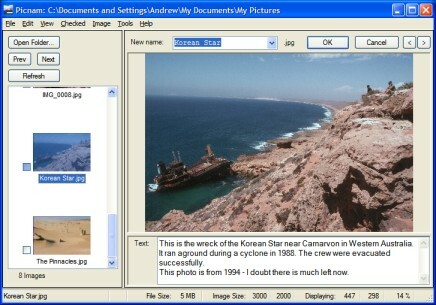 Picnam is a simple way to manage digital photos and other images. It allows you to easily rename photos so they are easy to find, and allows you to record information about the image in a related text file. Renaming an image is as simple as typing the new name and pressing Enter. No right clicking, double clicking or navigating through menus is required. You don't need to type the extension - it is added automatically. A drop down list allows you to recall and edit a previous name when you are giving several photos similar names. The image is shown as large as possible so you can see details. You can click on the image to enlarge it to full size to check fine detail. You can record information about an image, which is saved in a text file with the same name. Data in text files can be used from most programs and read and edited on any system without special software. You can record large amounts of information, and create templates if you need to insert the same data for multiple pictures. Picnam moves, copies and renames the text file at the same time as the image. Multiple pictures can be renamed at the same time using the Bulk Rename function. The new name can be a simple name, or you can create a pattern to include the photo date and time in various formats (including the day of the week), parts of the old name, incrementing numbers and a counter. Buy Picnam now for only $14.95 (US), or try a fully functional copy free for 30 days. Money back promise: If you are not happy with Picnam within 45 days of purchase your money will be refunded, no questions asked. Windows Vista, Windows XP, or Windows 2000. Windows 98 works with some minor issues - see the Readme file for details. Microsoft .NET Framework is required. This is a free download from Microsoft which might already be installed on your computer. The Picnam installation program will check whether it is installed, and if not it will download and install it for you. Picnam works with JPEG, TIFF, BMP, GIF and PNG files.